A few of the recent Favorite Zelda Moments posts I’ve written have covered fairly obscure moments that I’m not sure a ton of people would have considered one of their favorites — such as fricken’ Moldarach — but this one’s different; nearly everyone knows about the introductory portion of A Link to the Past and I’d be surprised if there were not a number of people who loved this part of the game. This section is what the game starts off with. Establishing the now classic tradition of Zelda games opening as Link wakes up, Link is awoken from his slumber by a telepathic message from Princess Zelda, asking him to come save her. Disobeying his uncle and leaving the house, Link makes his way to Hyrule Castle through the rain to iconic music and sneaks inside (with more iconic music) to inherit a sword and shield from his dead or injured uncle and then save Zelda so they can make their escape. Obviously this entire portion — finally ending when you reach the Sanctuary through the sewer passage — is quite excellent and very memorable. Who could forget an adventure game that begins with a dangerous nighttime infiltration mission through rain and castle, witnessing the death of their guardian, to rescue the princess? This is like literally the stuff of epic blockbuster movies, the kind of stuff that grips you and forces you to keep watching when you go see it at the theater, or that makes you cuss audibly for missing it because you had to go to the restroom while the movie started. Bottom line is the scene is epic, and doesn’t need defending on that front. It’s also an excellent part of the game — particularly for one of Zelda’s now-infamous but then-favorable opening sections — as Hanyou outlined in his article on the subject in more eloquent wording than I could come up with here. So why then am I writing about this moment if there’s little to say about it? Well, while the merits of this section in and of itself don’t require explaining, I do think this moment is pretty interesting and impressive if you hold it up against the rest of the series. A Link to the Past is not praised for its story. Certainly, it’s one of the most story-driven of the pre-Ocarina of Time games, but that doesn’t mean it relies on its story or relates an especially impressive one. As many have said, early Zelda stories — and even some recent ones — are pretty bare-bones tales. So why, then, did a game with a bare-bones story manage an opening far more epic and gripping than most recent (and far more cinematic) Zelda games? Don’t get me wrong, I like the idea of the story starting off in an idyllic village before trouble and adventure starts, but it’s certainly a much slower and less-gripping beginning. Yet games like The Wind Waker, Twilight Princess, and Skyward Sword are considered the most cinematic experiences in the series, while their introductions are outdone by one of the earliest titles. The fact of the matter is that, regardless of whether it was story-based or not, and regardless of its cartoony and simple sprite-based visuals, A Link to the Past was in fact a very cinematic experience and, with what it was given, actually out-performed its successors. And this section — “The Time of Falling Rain” — most exemplifies that. This has got to be my favorite introduction to a Zelda game — perhaps barring Majora’s Mask — and I’d love to see more moments like this at the beginning of the game or otherwise. Late-game infiltrations, rescue missions, and escapes through secret passages to awesome music could provide for great cinematic moments that would be a nice change of pace, but having equally epic and/or dire moments with perhaps different events and circumstances as a game’s intro are just as welcome. I’m particularly curious what the introduction of A Link to the Past’s upcoming sequel on the 3DS is going to be like in comparison. As it stands, this is, in my eyes, one of the most epic moments in the entire series, and I think it should be matched or surpassed more often than it is. How about you guys? 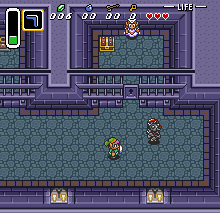 Did you think this part was great, not so great, or have you yet to even play A Link to the Past? How do you think it measures up to other Zelda game introductory portions? Would you like to see more moments like this? Tell me in the comments!